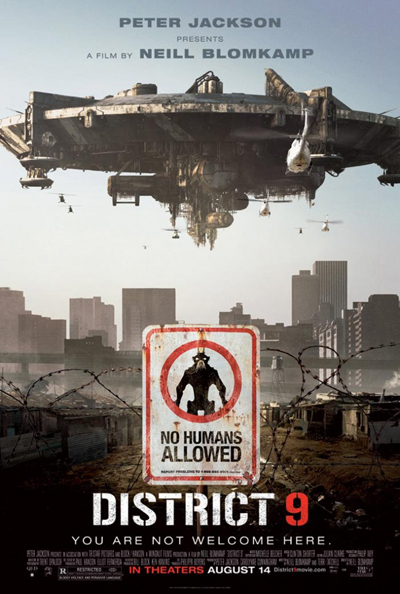 biermagazine.com » District 9 – Rating: A- or B- ? District 9 – Rating: A- or B- ? Alien encounters are film features that can either creep out audiences like The Thing or steal your heart like E.T. ; the mystical aura that surrounds a Sci-Fi movie can be a stimulating experience for moviegoers. Walking into the Peter Jackson produced District 9 you’ll think you’re about to watch an Independence Day rip-off, but discover you’ve just brought a ticket to a film that beautifully and unexpectedly imitates life, leaving you squalling in the shame and disbelief of political treachery. For 20 years, an alien spacecraft has been hovering over the city of Johannesburg, South Africa, leaving millions of sick and malnourished aliens, who are referred to as prawns, stranded on Earth. With their arrival comes racial tension and concern, as humans begin to fear and mistreat prawns, seeking to contain the alien population from the rest of the world. As a result the alien species is moved to an inner city slum known as District 9, where they share and establish a black market filled with special weaponry, interbred prostitution and other illegal activities with a group of slumdog Nigerians. 20 years later the situation at District 9 has become a societal nuisance. A private government agency referred to as the Multi-National United looks to relocate the 1.8 million residents of District 9 to a concentration camp known as District 10. In charge of the campaign is Mr. Wikus van der Merwe (Sharlto Copley)—An MNU field operative who’s accompanied by military troops to send out eviction notices to the prawn population. While inspecting suspicious activity at an alien residence, Wikus confiscates a special device that sprays a black fluid on him, making him feel a little under the weather. Doctors begin to run tests on the MNU worker and discover he’s transforming into a prawn. Wikus is now quarantined under government surveillance and is utilized as a guinea pig, testing alien-registered weaponry and partaking in several experiments. Miraculously escaping, Wikus finds sanctuary in the one place he once planned annihilating: District 9. Ironically running into an alien (named Christopher Johnson) whom he was about to evict, Wikus learns this foreigner can help him re-transform into a human, but needs the capsule that contaminated Wikus in order to take him and his son back home to save their planet. The prejudicial tension present in this film is astonishingly accurate for today’s medium. The docudrama cinematography adds a unique twist to the story, plus the chemistry between actor Sharlto Copley and the CGI-encrypted Christopher Johnson character is a buddy-buddy relationship that flourishes once the duo is put against the grain. The environmental presentation of the slums in Johannesburg, South Africa is surreal, and while the CGI might seem overdone, the results produced from some of the action scenes are jaw dropping. District 9 is arguably the summer’s biggest sleeper hit. Where Transformers fails to create authentic fantasy action and an intriguing storyline, this film steps up in its place as the season’s best. You’ll become emotionally attached and absorbed by District 9. Beer Pairing: The recommendation here is Amstel Light— A foreign beer with a smooth taste that’ll make you feel right at home. If you look at the movie and think that it’s just about aliens being colonized and people blowing stuff up, you’re only half right about the movie. Director and writer Neill Blomkamp is a native South African born in Johannesburg, and it’s not difficult to see his social commentary about the treatment of the oppressed during the apartied. ‘District 9’ is a full-length inspired by Blomkamp’s short film “Alive in Joburg” where he de-personified the people suffering from the Apartied and made them aliens instead. Due to public objection of the aliens being stuck in South Africa, a company Multi-National United (MNU) is given the task of relocating the “refugees.” The task is ultimately given to Wikus Van De Merwe, a bumbling-fumbling-clueless clean cut guy who happens to be married to the boss’s daughter. It’s clear this is what he’s doing in the full-length film. In some regards it is plausible to try and make social commentary even if it is disguised as an action flick. Unfortunately, for American movie goers, the film’s social premise may go over their heads including something’s with the film that may be questionably offensive. When the aliens are housed separately from everyone in Johannesburg and are merely tolerated rather than accepted, you have Nigerian criminals attempting to profit from the grief of the aliens. In seeking ways to use alien-weapon technology, the Nigerians are portrayed as savages (including inter-species prostitution and voodoo like sacrifices. Offensive so blatant, I almost left the theater). These mishaps, although may not have been intentional, did leave a bad taste in my mouth towards the film which was ultimately a damn good action flick. The special effects and costuming team opting to have costumes for the aliens rather than computer generated actors gave the movie a more realistic feel that served perfectly for intense moments and allowing the audience to connect with no-name actors (at least for the American public). Overall I believe that Blomkamp’s direction was a noble effort in voicing his disdain for how South Africans were treated during that period, and his heart seems to be in the right place. But don’t get it twisted: This movie is designed to be a summer hit, and everything else is secondary. More than the story itself I am impressed with the direction of the movie with a shoe-string budget of $30-million dollars and his ability to have an action packed film. I’m interested in seeing what he does next. 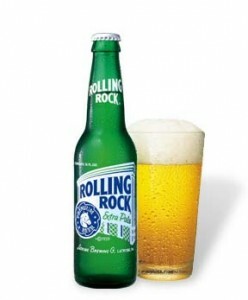 Beer Pairing: ‘Rolling Rock’ because it’s a fun beer. It’s like going on a date with a chick that you had fun with. Nothing more, nothing less.